The game is very generous with the free spins bonus where you can win up to 100 free spins and up to 30,000 coins during. The scatter is the Pilgrim symbol. Land 3, 4 or 5 and you win 10, 20 and 100 free games respectively with a 3x multiplier. The second scatter is the Mayflower symbol. Landing 3 or more anywhere on the reels will trigger the Pumpkin Patch Bonus. In this round the reels are replaced with pumpkins with jackpot turkeys behind some of them. Prizes range from 1000 to 10,000 coins and you get to pick till you win one. If you happened to win the big bonus while on a free spin round then your prize is tripled and you win 30,000 coins!!! The jackpot can be won by both the Wild Turkey or the Women symbols when you hit 5 of each. This will reward you 7,500 coins. The Wild Turkey symbol is also a wild symbol and will substitute any other symbol to create a winning combination. On top of that when you get 1, 2, 3 or 4 Wilds your wins are multiplied by 2x, 3x, 4x and 5x respectively. Yes, you read right and this means that you can always win big with this game! 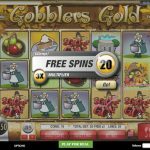 Gobblers Gold is a very rewarding game. In almost every aspect of it you could win big and play for a long time. The graphics is not very strong here but if you care about gold then it doesn’t really matter. How about something completely different? Try playing Gnome Sweet Home a 5 reel slot by Rival.